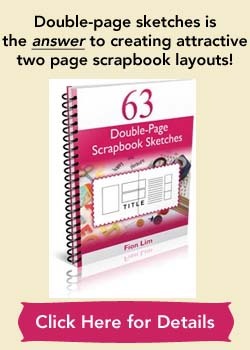 This scrapbooking idea is a fun and light-hearted one. 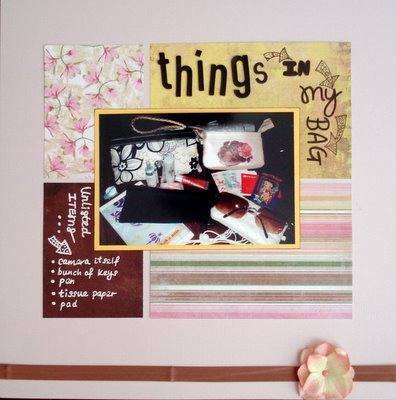 To scrapbook a page on the everyday, essential items in your handbag or purse. We women love to carry a bag with us everywhere we go. In our little or big bags, we carry a ton of stuff! And these items in our bags reveal a facet of us. So take some time to unload everything in your bag this week and take a picture of the items hiding in the comfort of your carry-it-all. You might already know exactly what’s in there. Or you’ll be amazed by the little forgotten bits you’ve casually tossed in there a long time ago. Doesn’t matter. What matters is that there’s a page to celebrate the little essentials you’re so used to carrying along whenever you are on the go. Supplies used: Cardstocks – Bazzill Basics; Yellow cardstock – The Paper Company; Patterned papers – Basic Grey “Sultry” Collection; Letter Stickers – American Crafts “Thickers” Vinyl; Ribbon – Wheel & Anchor Satin Bias Tape; Silk flowers – stash; Black Marker – Zig Memory System “Dotta-Riffic”; White pen – UniBall Signo Broad “White”; Black pen – Zig Memory System “Millennium”; Black ink – Versa Color; Pink brad – KCK Craft; Sketch: No. 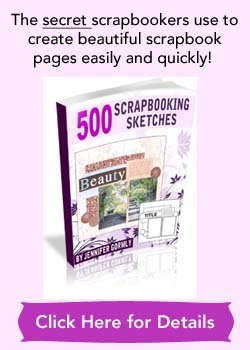 042 of 500 Scrapbooking Sketches.